Steaming asparagus or other vegetables can be achieved either in an electric steamer or by heating water in a saucepan with a collapsible vegetable steamer inside. Both methods gently cook the ingredient using indirect heat from the steam released from the boiling water. 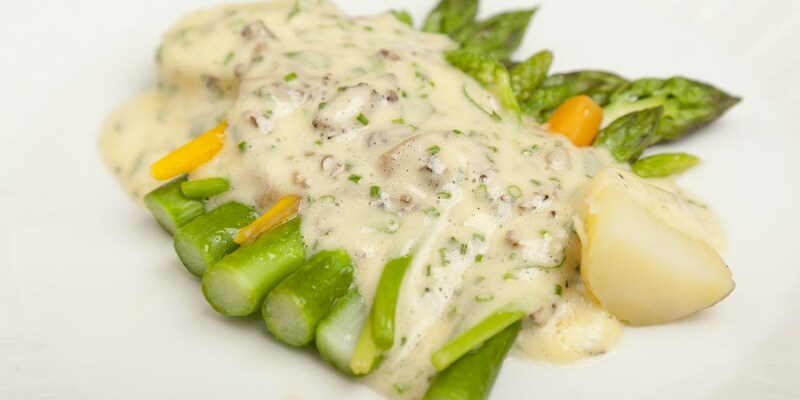 The main advantage of steaming an ingredient is that it adds no other flavouring, which makes it a particularly apt technique for bringing out the fresh, natural flavours of asparagus. Gently steaming asparagus helps to lock in its bright, fresh flavour, so suits pairings with subtle ingredients. Asparagus suits anything from an uncomplicated drizzle of olive oil and lemon juice to ingredients such as sea trout, poached egg or sea bass. Marcello Tully steams asparagus for his Hot smoked salmon and potato salad recipe, making the most of the vibrant flavour of the ingredient.